Supporters of Reading and Sheffield United are planning to pay tribute to former player Chris Armstrong during Saturday's FA Cup fourth-round game. The pair meet at the Madejski Stadium and fans are planning a round of applause in the third minute of the game - his squad number for both clubs. Armstrong was forced to retire from the game in 2011 at the age of 28 after battling multiple sclerosis. 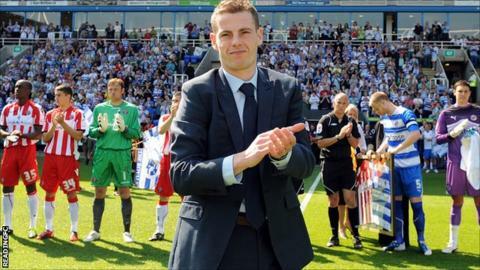 Royals boss Brian McDermott said it would be a "fitting tribute" to him. He continued: "Chris would never ask for anything. That's the nature of the man he is. "If that's what the Sheffield United and Reading fans wanted to do after three minutes then I think that would be very fitting for a person of the stature of Chris Armstrong - considering what he did for both Reading and Sheffield United, what he does as a person, and for football in general. I'd certainly join in." Armstrong played 48 times for the Royals and played over 100 times for the Blades. "I saw what he went through that summer , and we had to obviously keep things quiet. "He worked every single day, he got himself into a situation where he played a couple of league games for us, which was amazing. It was incredible. "The strength of character that he had to show was astonishing - what he's got inside, you can't bottle that. "We met up with him before the Newcastle game last week and invited him down to the game this weekend, it would have been great to have him here, but unfortunately he has to stay in the North East - as his little girl Frankie is celebrating her first birthday and he's got a party to organise. "But that's Chris for you - he would not want the fuss!"